This concert of music for solo guitar , voice and flute includes choreography for several of these works. The guitar solos include Invocación y Danza [Invocation and Dance], Junto al Generalife [By the Generalife], En los trigales [In the wheat fields] and Entre Olivares [Within the Olive Grove]. The extraordinary Dos poemas de Juan Ramón Jiménez [Two Poems by Juan Ramón Jiménez] for flute and voice and the beautiful Coplas del pastor enamorado [Ballad of the Shepherd in Love] for flute and guitar and the Cuatro canciones sefardíes [Four Sephardic Songs] for show the tremendous variety found in Rodrigo’s music. Classical Spanish Dance choreography for Pequeña Sevillana [Small Sevillian Dance] Tres canciones españolas [Three Spanish Songs] and the exquisite Aranjuez ma pensée [Aranjuez in my thoughts] will complete this exciting program. DATE: Thursday, May 2 , 2019. “A born star who effectively stole the show” is how the press describes mezzo-soprano Anna Tonna. Well known for her commitment to the music of Spain and Latin America, her performances have been depicted as “…full of charm and magnetism with her dark, compact lyric mezzo-soprano, ideally suited for the flamenco-like vocal flourishes of Spanish music”. She has appeared with the Casals Festival of Puerto Rico, Festival Iberoamericano de las Artes in Puerto Rico, Música de Cámara of New York, Festival de Segovia (Spain) among others. In opera she has sung leading roles with Teatro Grattacielo in Lincoln Center, New Jersey State Opera, Opera Illinois and Opera de Santo Domingo among others. 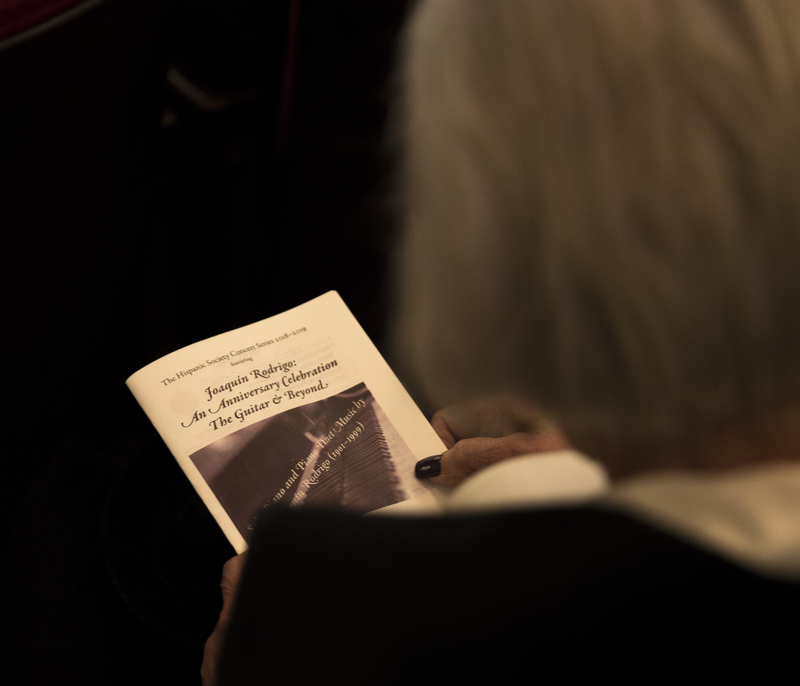 Her recital of “Songs of post Civil War Spain” at the Fundación Juan March of Madrid was broadcast live by Radio Television Española and hailed as “a tour de force” by Spanish newspaper ABC. It is to be noted her appearance in June of 2012 at the St. Anton palace in Valletta, the presidential palace of the country of Malta, for a command performance for his Excellency George Abela. She recently co curated together with pianist Douglas Riva series of concerts dedicated to Spanish composer Enrique Granados at the Hispanic Society Library & Museum in New York City in 2015-2016. Anna de la Paz is a Spanish dance artist specializing in classical and folkloric Spanish dances. After living in Spain and studying with such great master teachers as Mariemma and Pedro Azorín, she moved to New York City in 1999 and began working with Gabriela Granados and American Bolero Dance Company. As a freelance artist, she has performed throughout the New York area at various venues including Carnegie Hall. Anna de la Paz works in collaboration with mezzo-soprano Anna Tonna on many productions including, “Music and Dance in the times of the Duchess of Alba (1762-1802)”, created for the Hispanic Society of America in New York City. She is the creator and producer of her own shows, which include Alegría Española, Migración and Memorias, and was on the creative team for Making Music Dance, a cross-fusion of flamenco, tap and world music. She was co-director of Walk to the Beat, an annual improvisational music and dance festival in Nyack, NY. In 2017, Ms. de la Paz was invited to perform in the Canary Islands, Spain at the A orillas del Mar festival in Gran Canaria. Anna de la Paz has been invited as a lecturer on Spanish dance at area colleges, universities and symposia, including the Foundation for Iberian Music’s international conferences on Enrique Granados in New York City and the “Transatlantic Malagueñas and Zapateados in Music Song and Dance” at University of California, Riverside. Anna de la Paz has dedicated much of her professional career to dance education. She has been on the faculty of the Baltimore Actors’ Theatre Conservatory in Baltimore, MD and Ballet Rockland in Garnerville, NY. She has also been a guest teacher at Coupé Theatre Studio and is currently a freelance teacher at the Helen Hayes Studios in Nyack, NY. In 2002, Anna de la Paz participated in a training program at City Center to become a teaching artist in New York City Public Schools. Since then, Ms. de la Paz has led many workshops and lecture/demonstrations and residencies in the schools School, Cherry Lane Elementary School, Nyack Middle School, Ramapo Freshman Center, Suffern High School, Ramapo High School and Dominican College among others. Born in Argentina, Federico Díaz is a versatile musician of the new generation of guitarists with a multifaceted career as a performing artist, arranger and composer. His performances have taken him to distinguished festivals and concert halls in more than 20 countries including: Wiener Saal and Solïtär (Salzburg), Otto Braun Saal (Berlin), Clara Schumann Saal and Kleiner Saal der HfMDK (Frankfurt am Main), Stadttheater (Mainz), Lisner Auditorium (Washington DC), Trinity Center (Philadelphia), SCAR (Rio Grande do Sul), Teatro Solis (Montevideo), Centro Cultural Kirchner (Argentina) and Teatro Independencia (Mendoza). He has appeared as soloist with the National University of Cuyo Symphony Orchestra, the Mozarteum University Chamber Orchestra, the Polish Chamber Orchestra Sopot and the Sinfonieorchester Magdeburg, among others. Federico is an avid chamber musician concertizing regularly with Lionel Cottet (cello), Emilio Argento (viola), Jeremias Serigiani (violin), and a variety of string quartets. As a soloist member of Ensemble d´Argent, a string orchestra based in Frankfurt am Main, he has performed new works as well as new arrangements for guitar and string orchestra every year since 2012. .
Celebrated for expanding the guitar repertoire, Federico has premiered works written for him by many composers such as Juan Falú, Bruno Cavallaro, Miguel Barreilles, and Agustín Castilla Ávila. He has also made and premiered a large number of transcriptions with his ongoing chamber music groups, including pieces by Franz Schubert, Luigi Boccherini, Pablo de Sarasate, Atahualpa Yupanqui and Astor Piazzolla. The label Epsa Music (Argentina) released in 2014 his newest CD “Perspectiva 204” of the duo DiaZ-WoiZ. In 2013 he did the premiere recording of “Divertimento on Austrian Folk Songs” by Bernhard Romberg with Lionel Cottet (cello) for Sony Classical. His first duo album “Danzarín” with Doble Tango was recorded in 2009 and presented in many world music and jazz festivals across the globe. As a sought-after teacher for Argentinian and classical music, he has been invited to give masterclasses in universities, conservatories and festivals in Germany, Mexico, Uruguay and Argentina. Currently, Federico is a doctoral student at the Graduate Center of City University of New York. Of Serbo-Croatian background, Ms. Kabalin is a founding member of the Sylvan Winds and serves as Artistic Director of the ensemble. She was presented in her New York recital debut at Weill Recital Hall as a winner of the Artists International Competition. One of five Americans invited to participate in the first International Flute Competition in Kobe, Japan, Ms. Kabalin also appeared as a soloist with the New York String Orchestra in Carnegie Hall and Washington’s Kennedy Center. Ms. Kabalin has served as principal flute with the New Philharmonic of New Jersey, the New Jersey Ballet Orchestra, the Stamford, Jupiter, and Queens Symphony Orchestras, and has played for the PBS-TV Great Performances production of Kern’s Show Boat. She has also performed with the Orpheus Chamber Orchestra, New York City Opera, the New Jersey Symphony and New Jersey Festival Orchestras, as well as the Westchester Philharmonic Orchestra. Ms. Kabalin is the flutist of the Paper Mill Playhouse Orchestra and has played numerous Broadway shows, as well as the Christmas Spectacular at Radio City Music Hall. A former member of the Hofstra University faculty, Ms. Kabalin has also taught in the Juilliard Music Advancement Program, at the Simon’s Rock campus of Bard College and Rutgers University, and has coached chamber music at the Manhattan School of Music. She has recorded for the Desto, Vanguard, Koch, CRI/New World and North/South labels.